The commendation was made by the National Co-ordinator of the organization Comrade Nnanna Nwafor while welcoming the Former vice president to this campaign tour of the southeast Nigeria to meet the delegates ahead of the Dec.10 Party primaries. 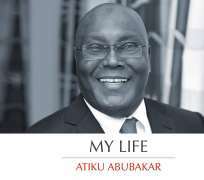 He stress that Atiku will bring the much needed added value and gave a sign of direction to the party. APC states across the country have performed better than their PDP counterpart because they have monumental achievement for all sectors that have direct bearing on the lives of the people and we urged the people to give APC the chance to produce the next president by voting Atiku as the party flag bearer for another mandate to continue his good works which he has been doing but this time as a president. He stress that the much needed change the country is clamoring for will be achieved if credible persons are elected into position of trust and the right political structures put in place which APC will provide. Atiku stands for unity, security, education and jobs With the dwindling Economic status of the country only Atiku has the political and Economic knowledge to stabilize our battered Economy, Stabilize the power sector, Solve the security challenges and create Jobs for millions of unemployed Youths if elected into the office of the president have acquired requisite experience and knowledge in management of Nigeria Polity and Economic stability. He regretted that Ndi Igbo has been short-changed in the leadership position and scheme of things in the country which will be corrected by the emergence of TURAKI as the president of the country.